Not to be confused with the earlier 'direct ascent' method, direct rendezvous (also known as short rendezvous) had the LM enter the terminal phase at the point where the CSI burn would normally occur. It relied on the confidence that had been gained in the spacecraft, radars and guidance systems over repeated flights. It also took advantage of the fact that although lift-off had to occur at exactly the right time, a missed launch would only require them to wait until the CSM came around again on its next orbit. Rendezvous began with a launch and insertion into orbit that was identical to the coelliptic method. As they rose on the ascent engine's flame, both the crew and mission control analysed the numbers coming from the spacecraft's two computers, checking that its performance was within the range expected. On insertion into lunar orbit, mission control could advise them of which computer, in their opinion, had measured the ascent more accurately. The crew then knew which numbers to watch as they fired the RCS thrusters to compensate for deviations in the ascent engine's performance. If their ascent had not been accurate enough to support this direct technique, the crew had the option to complete the rendezvous using the longer but more forgiving coelliptic method. Diagram of the direct or short rendezvous technique. Once established on their initial elliptic orbit, they had about 40 minutes during which - like musicians and their instruments in an orchestra - a flurry of tracking activity was struck up by all the players in the Apollo ensemble: the LM crew on their radar, their guidance computer and their backup computer with its own instruments; the CMP on his VHF transponder, his sextant and another computer; and mission control with tracking stations around the world chorusing on large computers in Houston. They all carefully, and repeatedly, measured the flights of two spacecraft hurtling around the Moon. Like a band rising to a perfectly harmonised chord, they each derived solutions for the upcoming TPI burn and compared them. If the commander could see that all the solutions, including his, were converging towards a common answer, then, with confidence that his own system was working well, he would choose the solution generated by his PGNS. Because the TPI burn was relatively large for a direct rendezvous - it had to turn their 17-kilometre perilune into a 113-kilometre apolune - it was made using the ascent engine. Any residual velocity that had to be made up could be achieved with the RCS afterwards. metres per second overall. Mitchell was telling them that, as far as mission control could tell, only 2.5 per cent of that capability remained, which was enough for a 6.5-second burn. 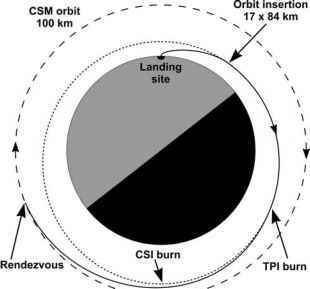 In the event, their TPI burn needed to last only 2.6 seconds, and by using the ascent engine, they saved wear and tear on the RCS thrusters that might be needed in case of problems prior to docking with the CSM. As was typical for Apollo, it was not considered enough to have the PGNS, the AGS, their crewmate in the CSM and people back on Earth all working to find a solution to the size and direction of the TPI burn. 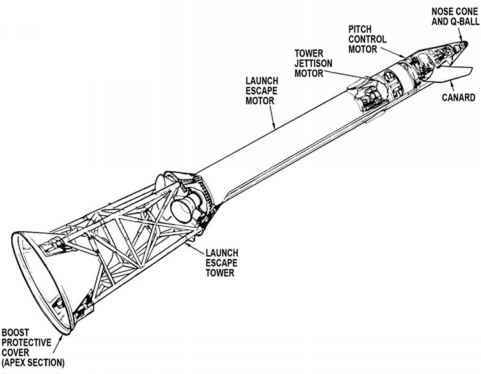 NASA's mentality for such a critical operation as rendezvous was to give the crew options wherever possible, so for a fifth attempt at the answer, the LM crew carried a set of charts with which, if everything else failed, they could derive a usable solution for TPI and reach the CSM safely. Scott explained how they worked: ''In simple terms you needed range, rangerate, angle and time. The equations allowed you to draw a curve on a chart which was a nominal curve. At certain points, you would have a known range, range-rate and angle to the target. What you did on the charts was, at the specified time, to look at the range, range-rate and angle to the target and match that with the nominal. If it didn't match, you would change the range, range-rate or angle by cranking in a correction off another chart. You can lose communications with the ground; you can lose the PGNS and the AGS and still do the rendezvous because all you need is a watch and the COAS and the radar. The TPI burn usually occurred over the Moon's far side, out of communication with Earth. As much of the subsequent approach was also out of sight of Earth, the crew relied on regular measurements by both spacecraft of their separation distance, their rate of closure and their angle with respect to each other. Solutions for possible mid-course corrections were compared and burned with the RCS jets. Their progress was constantly cross-checked on charts, and the target viewed against the background of stars to check for any apparent movement.